It is no secret that I adore designing and writing for a wedding invitation. 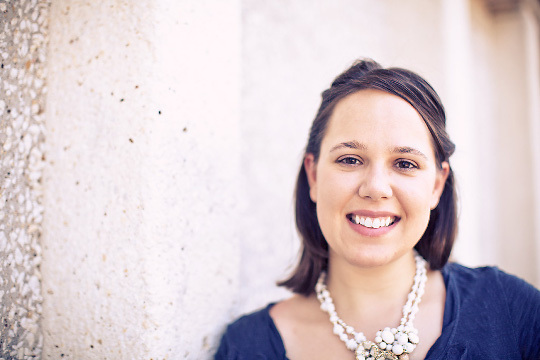 When I get to partner with an amazing stationer and bride who want everything in calligraphy for the wedding invitation, program, menu, seating cards and thank you notes…. Life is good. Here is a peek at what I did with Rock Paper Scissors for the lovely Katherine’s wedding stationery. 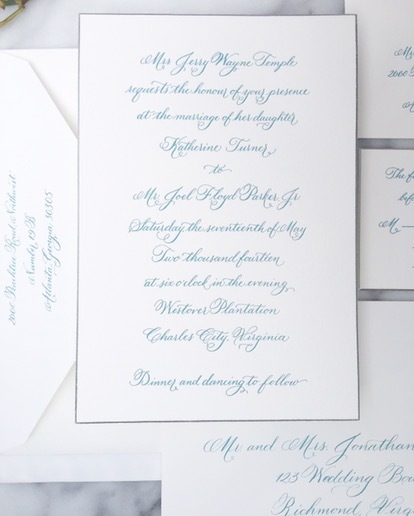 The invitation was beautifully letterpressed in a gorgeous teal color. The envelope addressing matched perfectly. 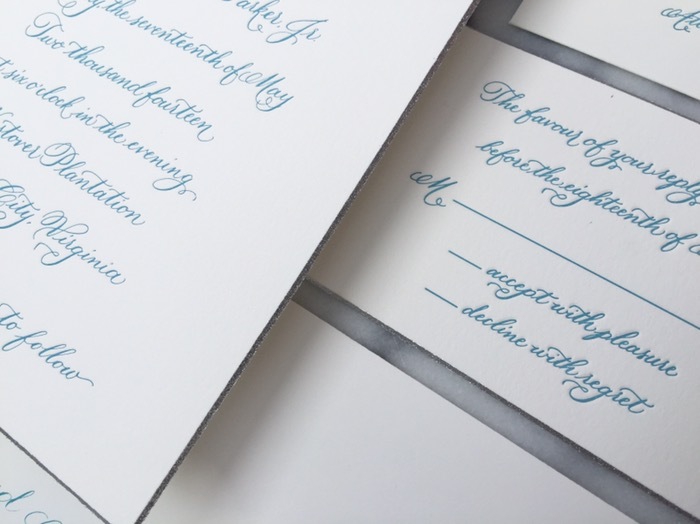 We chose a flourished calligraphy script that kept a happy playful feeling. The edges were beveled and painted in a silver. All invitation pieces were on a double thick crisp white paper. A true luxury. The program was flat printed using calligraphy and type with a tree illustration from the venue. 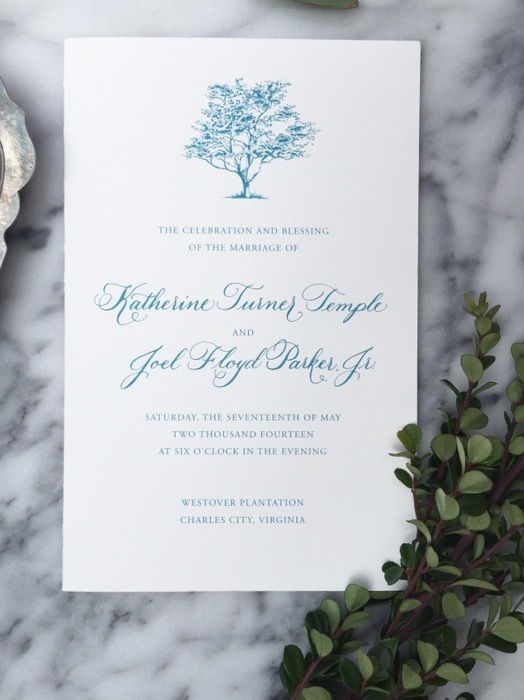 It is perfect in combining the wedding invitation details with a slightly different look. The tree is perfect for the ceremony on a lovely plantation. This was a folded piece with front and back printing for all the content. A close up detail of the letterpress printing. And stunning beveled edge with silver painting. I love all the texture this invitation has! You can also see how thick the paper really is. To finish everything off, Katherine chose to have note cards and calling cards made to complete her personal stationery moving into married life. 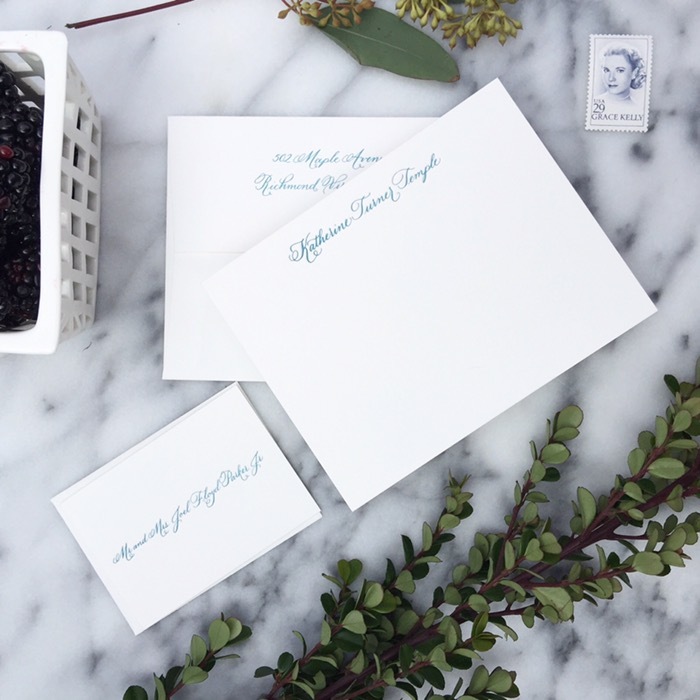 She had note cards made with her maiden and married name so she could use them throughout the entire wedding process! It is so nice to have custom note cards on hand to send any time. These are just so beautiful – I would write notes to share with others!